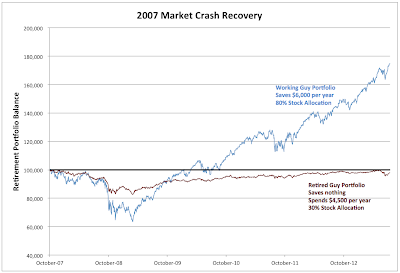 In my last post, I used the following chart to demonstrate how much longer it took a Retired Guy's portfolio to recover from the 2007 market crash than it took a Working Guy's. Throughout this period, Working Guy was saving an additional $6,000 per year in a portfolio that held 80% in stocks and 20% in bonds, while Retired Guy was spending $4,500 per year from a portfolio that held a 30% stocks. 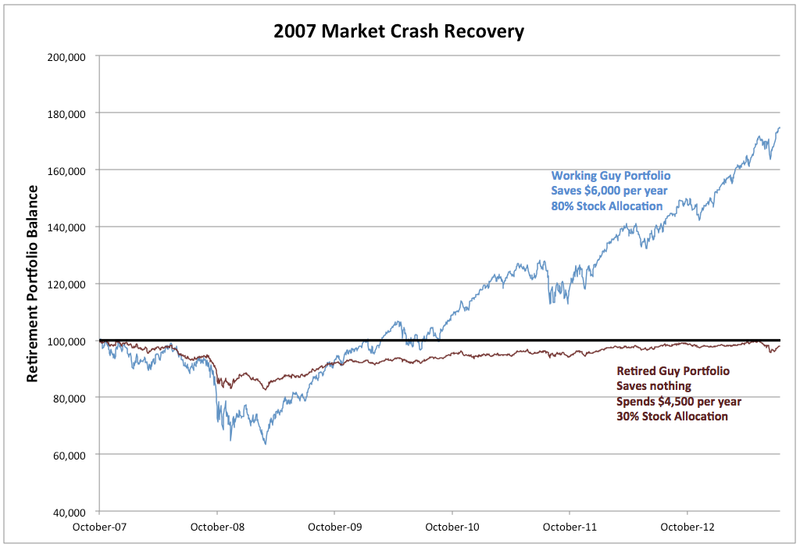 In the case of the 2007 market crash, the simple answer is no. 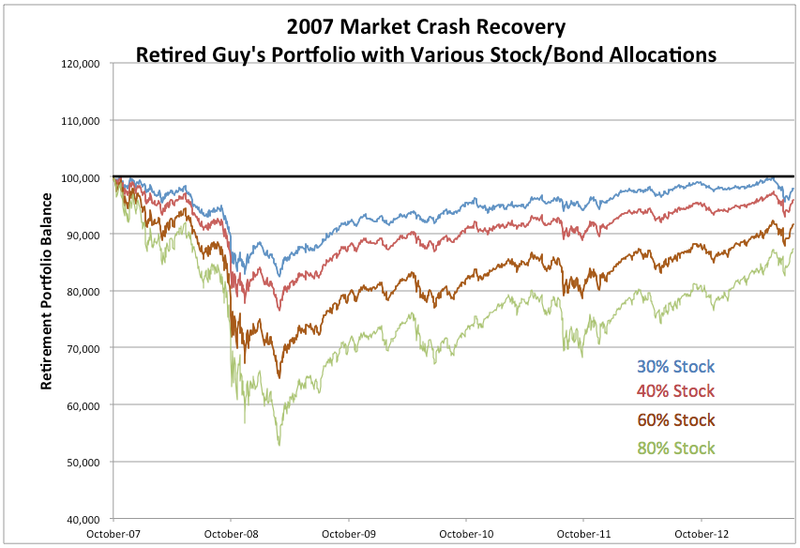 A more aggressive portfolio would have recovered even more slowly because it would have fallen much further by the March 2009 market bottom. The S&P 500 index, as represented by the index fund SPY, recovered from the bottom much more quickly than Vanguard Total Bond Market index fund (VBMFX), as you would expect. The following chart from Yahoo! Finance compares the two investments from the bottom of the crash until today. However, if you compare the two funds from the pre-crash peak, you will see that the stock fund only recently caught up with the bond fund. 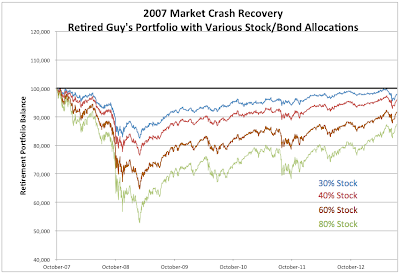 The following graph shows Retired Guy portfolios with various allocations of stock over the period from the 2007 peak until recently. More aggressive allocations climbed back at a faster growth rate but had dropped further on March 2009. Any stock allocation greater than 30% has not yet recovered by then end of July 2013. When will they recover? If the current bull market continues, some Working Guy portfolios will probably recover in the next year or so. But, this bull is getting long in the tooth. We may also encounter another bear market before these portfolios return to their 2007 peak value and it could be years more before they recover. Of course, Working Guy's portfolio recovered a long time ago, early in 2010 and more quickly than the S&P 500, because Working Guy continued to pour new savings into his portfolio without spending any of it. You can't do that after you retire. 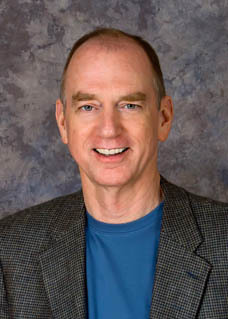 It is entirely possible that many retirees will sell at the bottom and never regain their October 2007 portfolio peak balance. But that has been the point of my last two blog posts. Managing your portfolio after you retire is an entirely new ball game. Wow. That's a great comparison and contrast. Of course it's easy to understand this concept, but the size of the difference for working/retired guys is striking. The silver lining is that Retired guy with 30% equities presumably wasn't looking to massively grow his balance, and so may be 'satisfied' to have happily plugged along pulling out his money for 5 years of living and now have a balance approximately where he started. I'm still a working guy and have see my account behave like Working Guy's. But when I'm retired, but would hope I could cross a chasm like the 'Great Recession' and be nominally where I started, having made 5 years of continuous withdrawals. Ron, expectations are indeed the point. The correct expectation is that once you retire and start spending from your portfolio, it will not recover nearly as fast as the market does.